Pancakes in a glass, anyone? While Starbucks may not have figured out how to put the taste of pancakes in a drink quite yet, it seems IHOP has. And they've combined it with alcohol to boot! The pancake house, which famously changed its name to the International House of Burgers or IHOB earlier this summer in a marketing stunt, only to change it back again, is trying another name change — sort of. Before you get your pancakes in a bunch, it's important to know that the name change is purely for a brand new product. That's because the company is putting the taste of its pumpkin spice pancakes into a beer ... yes, a beer! The new "IHOPS" (Get it? "HOPS" for beer instead of IHOP?) Pumpkin Pancake Stout was inspired by IHOP's seasonal menu that features pumpkin spice pancakes, cinnamon pancakes and new pumpkin-cinnamon pancakes that are called Pumpkin Cinn-A-Stack. Brewed by Keegan Ales in New York, the beer is made with IHOP's actual buttermilk pancake batter, plus maple syrup and other fall-like ingredients that are already in Keegan Ales' stout. 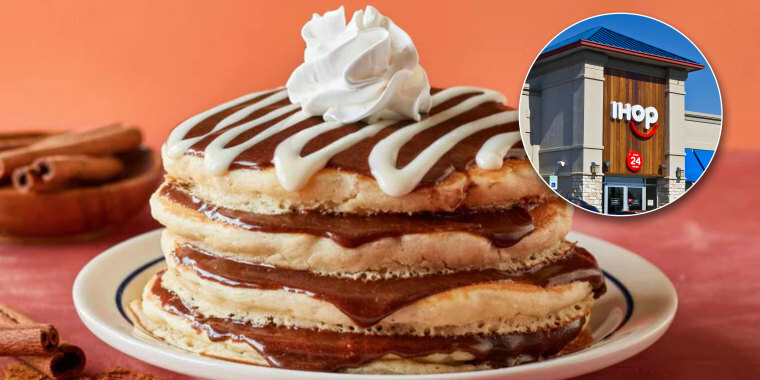 "The plan is to blow your mouth's mind by bottling that warm-and-fuzzy feeling of pancakes just in time for fall," according to the beer's website IHOPS.beer. So far, many people on social media seem pretty excited about the idea, but there are definitely those who think it sounds, well, "gross." IHOP created a pumpkin pancake beer called IHOPS.... gross I'M INTRIGUED. The company only brewed about 20 barrels of IHOPS, so the beer isn't going to be for sale at IHOP restaurants. Instead, it will be available only at select New York state bars and food festivals like the Bacon and Beer Classic on Sept. 29 at the USTA National Tennis Center in Flushing Meadows, New York. Here is a complete list of dates and locations where customers can try the beer. And, no, IHOP says there are no plans to rename the restaurant IHOB for "beer". Phew!